Context: Current literature demonstrates a lack of comparative studies regarding effective techniques for reducing laparoscopic lens fogging. Aim: Our primary objective is to determine the efficacy of various laparoscopic defogging techniques (LDT) through a randomized controlled trial that employs a novel simulation model of the abdominopelvic cavity. Settings and Design: This study was conducted at academic community hospital. This study design was a randomized controlled trial through simulation. Subjects and Methods: A chamber was constructed that simulated the abdominopelvic cavity. We used 5 and 10 mm 0° laparoscopes. A 10 cm visual analog scale was developed to assign visual clarity (VC) scores. The 10 cm mark indicated perfect VC. We employed the following LDTs: (1) glove warming (GLOVE), (2) surfactant solution (Fog Reduction and Elimination Device [FRED]), (3) chlorhexidine solution (SOAP), (4) warm saline (SALINE), and (5) control. Three observers were blinded to the LDT used. Primary outcomes included VC scores at designated time intervals (5, 30, and 60 s) for each LDT. A minimum of 10 observations per time interval were required to achieve adequate power based on a 2.5 cm difference in VC scores. Results: For the 10 mm laparoscope, FRED, SOAP, and SALINE had a VC score at 60 s (VC60) higher than control (4.8 ± 2.2, 7.8 ± 0.8, 7.9 ± 0.7 vs. 2.4 ± 0.72, P < 0.05). Both SOAP and SALINE VC60 scores were higher than FRED (7.8 ± 0.8, 7.9 ± 0.7 vs. 4.8 ± 2.2, P < 0.05). 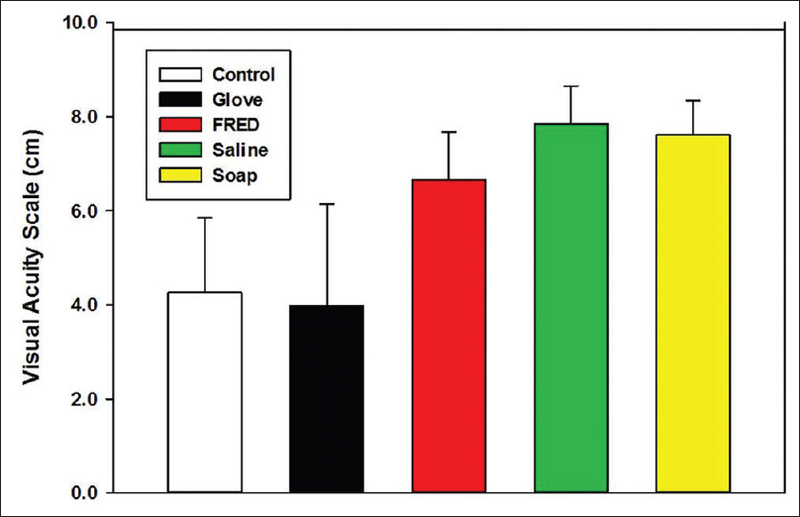 No differences were noted in VC60 scores between control and GLOVE (2.4 ± 0.72 vs. 3.1 ± 2.2, P > 0.05) and between SOAP and SALINE (7.8 ± 0.8 vs. 7.9 ± 0.7, P > 0.05). Similar results were noted with the 5 mm laparoscope. 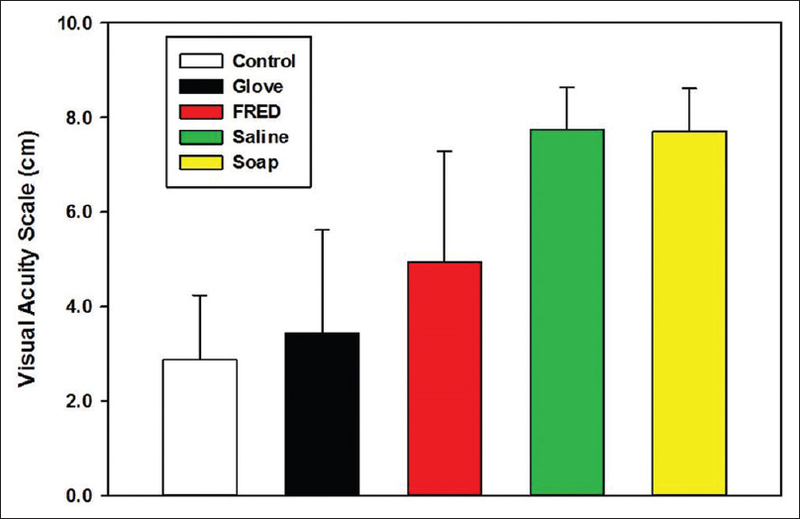 Conclusions: Common LDTs such as SALINE and SOAP were more effective than FRED, while GLOVE was no different than control. These results demonstrate that the use of effective LDTs can potentially translate into improved patient care and operative outcomes during surgery. Laparoscopic surgery is the preferred route compared to open surgery for many surgical specialties including gynecology. The benefits of a laparoscopic approach include less blood loss, length of stay, postoperative pain, infection, morbidity, and mortality. Research and innovation aim to further optimize these outcomes by identifying and eliminating barriers in laparoscopic surgery. Laparoscopic lens fogging (LLF) is a major that obscures the operative visual field, which can affect patient safety, operative time, and costs. LLF is condensation caused by a discrepancy in temperature and humidity between the lens and abdominopelvic cavity. Current literature suggests that to avoid LLF, the laparoscope temperature must be maintained above 34°C within the abdominopelvic cavity, which holds an average humidity of 85%. Insertion of a cool lens into the warm and humid peritoneal atmosphere leads to LLF. Water droplets are held together by surface tension and then refract light, which resembles a fog when viewed through a lens. The initial entry and subsequent reinsertions of the laparoscope are associated with the greatest degree of fogging, which decreases once the lens equilibrates to the conditions of the abdominopelvic environment. Studies have demonstrated four categories of laparoscopic defogging techniques (LDTs): (1) mechanical warming, (2) anti-fog solutions, (3) instrument innovation, and (4) alternative methods. Examples of warming include placing the laparoscope tip in a warm saline container, warming the lens with a gloved hand, or using the Scope Warmer (JosNoe Medical, Nixa, Michigan, USA). Lens fogging can also be reduced without warming techniques. The Fog Reduction and Elimination Device (FRED) solution (Medtronic, Minneapolis, MN, USA) uses isopropyl alcohol and amphiphilic surfactant to decrease surface tension of water droplets to allow incoming light to pass through unaltered. Similarly, povidone-iodine and chlorhexidine gluconate solution have also been reported to be effective. Instrument innovation described in literature includes the Insuflow device (Lexion Medical, St. Paul, MN, USA) that alters the insufflation gas to a temperature of 35°C and 95% humidity. Another innovative method includes coating the lens with superhydrophilic, irradiated titanium dioxide, which is fog resistant. Some 40 additional methods have been described to prevent LLF. However, the current literature demonstrates few comparative studies that objectively address which defogging technique is most effective., Our study's primary objective is to determine the efficacy of various LDTs through a randomized controlled trial that employs a novel simulation model of the abdominopelvic cavity. We conducted a randomized controlled trial undertaken at St. Luke's University Health Network (SLUHN) in Bethlehem, Pennsylvania. This study was exempt from approval by the Institutional Review Board of SLUHN as no human subjects were involved. A simulation chamber was constructed from ¼-inch acrylic glass and insulated with opaque material. A Venta Sonic VS100 humidifier (Venta, Chicago, IL, USA) was attached to the 45 cm × 45 cm × 60 cm chamber through 5 cm × 20 cm flexible, plastic tubing. The chamber was held constant at 81% ± 3% humidity with a temperature of 36°C ± 2°C. Temperature was controlled by the Ranco ETC-111000 (Robertshaw, Itasca, IL, USA) which was connected to a heating plate located within the simulation chamber. All observations were carried out at SLUHN during one session in a standard operating room at 21°C and 22% humidity. We employed 5 and 10 mm 0° Endoeye laparoscopes (Olympus, Bethlehem, PA, USA) connected to a 43-inch 1080pi monitor (Olympus, Bethlehem, PA, USA). A visual analog scale was used to assess visual clarity (VC). The observers were instructed to place a mark on a 10 cm line that best represented their perceived VC, with 0 cm representing total visual obstruction and 10 cm representing perfect VC. The efficacy of the VC scale was determined by rating four still images of varying visual clarity (VC1, VC2, VC3, VC4). The ratings were determined by four independent, experienced, laparoscopic surgeons. The observers were blinded to the clarity and replication rate of the images shown. Each VC image was assessed in random fashion four times by each observer for a total of 64 readings. The mean of the observed VC score for each still image was calculated. To further assess the VC scale, mean differences were noted for inter- and intra-observer VC scores. The laparoscope lens was exposed to the following LDTs for the study: (1) glove warming, which consists of applying manual friction to the end of the laparoscope with the palm of a gloved hand (GLOVE), (2) a sponge saturated with surfactant solution composed of isopropyl and water (FRED), (3) a 1:30 solution mixture of chlorhexidine and saline (SOAP), (4) a warm saline (38°C) bath (SALINE), and (5) control in which no LDT was used. Each LDT was applied for 5 s. These LDTs were selected due to their ease of use, cost-effectiveness compared to alternatives, and prevalence among laparoscopic procedures. The laparoscope lens was cleaned and focused for optimal clarity before each LDT application. A Fluke 62 Max infrared thermometer (Fluke, Everett, WA, USA) was used to detect the laparoscope temperature, which was 22°C ± 1°C just before the application of the LDT. Next, the scope was placed in the chamber 8 cm away from a laminated white card with black 12 pitch font. Finally, the three observers were allowed 10 s to assess the VC at 5, 30, and 60 s intervals. Randomization was carried out by drawing a preassigned LDT from a sealed envelope by an individual not involved in the assessment phase. Once selected, the assigned LDT was applied to the laparoscope lens, which was inserted into the chamber. Primary outcomes included the optimal VC scores at designated time intervals (5, 30, and 60 s) for each LDT. These time intervals were selected on the basis that lens fogging commonly occurs within the 1st min of laparoscope entry due to initial differences in humidity and temperature dynamics between the abdominopelvic cavity and laparoscope lens. Assuming a 2.5 cm detectable difference in mean VC scores with a standard deviation of 1.5 cm, it would require 10 observations for each LDT to achieve adequate power when applying a one-way analysis of variance (ANOVA) comparison (0.80, P = 0.05). Thus, each LDT underwent four applications with simultaneous VC scores being assigned by three observers, for a total of 12 VC scores for each LDT per laparoscope. The three observers were blinded as to the LDT used but not to the laparoscope diameter. All VC scores were presented as a mean ± standard deviation. ANOVA or Kruskal–Wallis method was employed to determine significant differences in each set of observations. If significant differences were noted, a post hoc multiple pair-wise comparisons using Student–Newman–Kuels test was employed to note any individual differences. VC scores at the 60 s mark (VC60) were used to compare VC scores of each LDT to each other. Significance was determined by P ≤ 0.05. All statistical calculation and graphs were performed using SigmaPlot™ software (Systat, San Jose, CA, USA). The performance of our visual analog scale results is listed in [Table 1]. Observed means were calculated (VC1, 9.2 ± 0.57 cm; VC2, 7.4 ± 0.65 cm; VC3, 4.4 ± 0.55 cm; and VC4, 1.4 ± 0.52 cm). The observed VC scores were all significantly different from each other (P < 0.001) as determined by ANOVA and Student–Newman–Kuels testing. Interobserver differences from the mean VC score of each standard image were noted to be <0.53 cm with a standard deviation <0.40 cm. Intraobserver differences were <0.35 cm with standard deviations <0.15 cm. With the 10 mm laparoscope, no differences were noted in VC scores among the LDTs in relation to observations made at 5, 30, or 60 s [Table 2]. When comparing VC60 scores of each LDT, a significant difference was observed (P < 0.001). Pair-wise comparison revealed the following findings: FRED, SOAP, and SALINE had VC60 scores higher than control (4.8 ± 2.2, 7.8 ± 0.8, 7.9 ± 0.7 vs. 2.4 ± 0.72, P < 0.05). Both SOAP and SALINE VC60 scores were higher than FRED (7.8 ± 0.8, 7.9 ± 0.7 vs. 4.8 ± 2.2, P < 0.05). No differences were noted in VC60 scores between control and GLOVE (2.4 ± 0.72 vs. 3.1 ± 2.2, P > 0.05) and VC60 scores between SOAP and SALINE (7.8 ± 0.8 vs. 7.9 ± 0.7, P > 0.05) [Figure 1]. With the 5 mm laparoscope, only FRED VC scores were significantly different when compared at the 5, 30, and 60 s observation (8.0 ± 0.6, 6.4 ± 0.9, and 6.6 ± 0.6, P = 0.003) [Table 3]. This difference was noted when comparing the VC5 score to the VC30 and VC60 scores. The FRED VC30 and VC60 scores did not differ significantly. As with the 10 mm laparoscope, significant differences were noted when comparing all of the VC60 scores for the LDTs (P < 0.001). When a subsequent pair-wise analysis was performed, several significant VC60 scores ratings were found. FRED, SOAP, and SALINE had a VC60 scores higher than controls (6.5 ± 0.6, 7.6 ± 0.7, 7.7 ± 0.5 vs. 4.5 ± 1.3, P < 0.05). Both SOAP and SALINE VC60 scores were higher than FRED VC60 scores (7.6 ± 0.7, 7.7 ± 0.5 vs. 6.5 ± 0.6, P < 0.05). No difference was noted in VC60 scores between controls and GLOVE (4.5 ± 1.3 vs. 4.2 ± 1.9, P > 0.05) and VC60 scores between SOAP and SALINE (7.6 ± 0.7 vs. 7.7 ± 0.5, P > 0.05) [Figure 2]. Although some differences were suggested between 5 and 10 mm laparoscopes, the lack of observer blinding to laparoscope diameter made comparisons suspect and therefore were not included. Our randomized controlled trial reliably compares laparoscopic lens defogging techniques. We noted that SOAP and SALINE provided superior VC60 mark when compared to FRED in both the 5 mm and 10 mm laparoscopes. Furthermore, the GLOVE technique was noted to be no different than control. It is a common belief that VC with a 10 mm laparoscope is better than a 5 mm laparoscope. Interestingly, this was not obvious from our data. However, since observers were not blinded to laparoscope diameter, any statement regarding this would need further testing. Lens fogging remains a common problem in laparoscopy that can be frustrating and potentially hazardous. Various techniques have been employed to help reduce fogging during laparoscopic procedures. However, whether one method is superior to another remains elusive. Comparative randomized controlled trials for various LDTs are lacking in the current literature. In their extensive review of various defogging techniques, Manning et al. concluded the need for well-designed comparative studies. Several studies have attempted to compare LDTs but are hindered due to study design concerns. Piromchai et al. compared three different surfactant solutions on head-and-neck endoscopes employing a misting apparatus to simulate fogging but failed to control for temperature, humidity, or scope dynamics such as lens temperature. Furthermore, their study did not utilize a laparoscope, and they provided no data supporting the performance of their visual analog scale. Chainansamit et al. compared the efficacy of baby shampoo and a commercially available LDT in nasal endoscopy. Although an in vivo study, the use of the nasal cavity makes a comparison to the abdominopelvic cavity difficult. In addition, they failed to include controls, utilized only surfactant based-LDTs, and did not assess the performance of their visual scale. Knauth et al. utilized a controlled simulated environment to compare both surfactant solutions and warming LDTs in bronchoscopy. They utilized a nonstandardized five-point scale and employed single shot still images as the basis for their comparisons. Their final end point was not VC, but whether the observer could complete the bronchoscopy based on the study image. Once again, they were utilizing bronchoscopy, which makes comparisons to laparoscopy challenging. The above-mentioned studies noted FRED to be equivalent to other LDTs. In contrast, we noted that SOAP and SALINE offered superior VC in comparison to FRED. We also observed that the VC of FRED differed greatly from application to application as demonstrated by the larger standard deviations when compared to SOAP and SALINE. Upon reviewing the manufacturer's guidelines for FRED, it states that, for optimal results, the solution must be allowed to dry before its introduction into the abdomen. However, we noted that more than 5 min was required for the solution to dry. We hypothesized that light source technology has advanced such that far less heat occurs at the laparoscope's tip than in the past, thus increasing drying time for FRED. Since the FRED solution was developed several years ago, it is possible that such guidelines have become obsolete for newer instruments. It would be impractical to wait over 5 min for the solution to dry. Consequently, we applied a discrete amount of surfactant solution with one pass of the lens on the FRED-saturated sponge. The excess solution was removed from the lens with sterile gauze before the laparoscope's introduction into the simulation chamber. We acknowledge that the improper use of the FRED solution can potentially reduce its efficacy and thus serve as a limitation of this study. Nonetheless, we deemed it unrealistic to wait over 5 min for the FRED solution to dry, which in turn obscures the operative visual field. We consider the manufacturer's guidelines to be out of date and subject to reevaluation by the manufacturer. Our study has several strengths. First, we used a blinded randomized design to generate reliable data. The efficacy of most LDTs described in literature are based on the subjective perception of the investigators.,,,, Second, we employed a controlled and simulated abdominopelvic environment. This allowed us to regulate important variables, such as temperature and humidity, which were replicated to similar parameters of in vivo conditions. Finally, we included a performance process for our visual analog scale that has not been utilized in previous studies. Although the rigors of a full validation were not undertaken, the performance of our scale revealed a reliable tool with inter- and intra-observer variations of VC in the 0.5 cm range with a standard deviation of 0.3 cm. However, for the study, we chose our sample size calculation based on much larger VC variations of 2.5 cm with a standard deviation of 1.5 cm. This would ensure an appropriate compensation for increased variability that may occur in our randomized controlled trial and to assess substantial differences in LDTs. The main weakness of our study was the lack of an in vivo model. Variables encountered only in laparoscopic surgery (e.g., electrocautery smoke, blood, fat debris, controlled cavity pressures, fluids, and washings) were not present during our simulation. These variables can certainly obstruct the operative visual field; however, they are not associated with LLF. LLF is due to physiologic processes related to humidity and temperature dynamics, and thus, we excluded the above-mentioned variables from our simulation. The physics of LLF determined why our primary outcome was limited to the first 60 s. The initial moments of laparoscope entry are when fogging is most likely. As the procedure continues, the laparoscope temperature equilibrates within the abdomen making LLF less likely. Of note,in vivo environments make direct comparisons difficult due to inability to control multiple variables from trial to trial. Vastly increasing sample size can overcome this problem. Although we used the most common LDTs, we did not include all of them. Additional LDTs would be a positive addition to our study since some surgeons show a preference for other techniques. Our preferences for the selected LDTs were based on their ease of use, prevalence in laparoscopic surgery, and cost-effectiveness. Comparisons of more expensive LDTs could have significant fiscal ramifications. Financial benefits of cheaper LDTs are probably modest but real when comparing just direct costs. Manning et al. provided a cost comparison of various LDTs: (1) Resoclear (RESORBA, Medical GmbH), $2.23, (2) FRED (Covidien), $4.71, (3) chlorhexidine (Baxter), $5.04, (4) Floshield (minimally invasive devices), $78.00, and (5) Insuflow (Lexion Medical), $40.00. Although not listed, the operative cost of warm saline is inconsequential as it is readily available during most surgeries. A cost-effective analysis was not done for this study; our study design would allow such comparisons in future in vivo studies. In comparison to prior studies, our randomized controlled trial provides reliable data to suggest that warm saline and chlorhexidine solution are superior techniques for reducing LLF when compared to FRED. Although our study design did not utilize an in vivo methodology, it is a step forward in directly comparing different LDTs while developing a standardized visual analog scale. We anticipate future studies to include other LDTs and operative variables while employing our simulation model. Furthermore, our methodology can help guide similar study designs within actual surgical procedures, which can effectively address additional outcomes of cost-effectiveness, operative times, and complication rates. The true impact of this assertion is out of the scope of this study and could be addressed in future in vivo studies. In preventing laparoscopic lens fogging, warm saline and chlorhexidine solution were more effective than surfactant solution, while glove warming was no different than control. This study was financially supported by Department of Obstetrics and Gynecology, SLUHN. Manning TG, Perera M, Christidis D, Kinnear N, McGrath S, O'Beirne R, et al. Visual occlusion during minimally invasive surgery: A contemporary review of methods to reduce laparoscopic and robotic lens fogging and other sources of optical loss. J Endourol 2017;31:327-33. Shabanzadeh DM, Sørensen LT. Laparoscopic surgery compared with open surgery decreases surgical site infection in obese patients: A systematic review and meta-analysis. Ann Surg 2012;256:934-45. Lawrentschuk N, Fleshner NE, Bolton DM. Laparoscopic lens fogging: A review of etiology and methods to maintain a clear visual field. J Endourol 2010;24:905-13. Mohammadhosseini B. Povidone-iodine surgical scrub solution prevents fogging of the scope's lens during laparoscopic surgery. Surg Endosc 2010;24:1498-9. Bessell JR, Flemming E, Kunert W, Buess G. Maintenance of clear vision during laparoscopic surgery. Minim Invasive Ther Allied Technol 1996;5:450-5. Waldron VD. Reducing endoscopic fogging. Am J Orthop (Belle Mead NJ) 2005;34:303. Sajid MS, Mallick AS, Rimpel J, Bokari SA, Cheek E, Baig MK, et al. Effect of heated and humidified carbon dioxide on patients after laparoscopic procedures: A meta-analysis. Surg Laparosc Endosc Percutan Tech 2008;18:539-46. Ohdaira T, Nagai H, Kayano S, Kazuhito H. Antifogging effects of a socket-type device with the superhydrophilic, titanium dioxide-coated glass for the laparoscope. Surg Endosc 2007;21:333-8. Piromchai P, Kasemsiri P, Thanaviratananich S. Alternative agents to prevent fogging in head and neck endoscopy. Clin Med Insights Ear Nose Throat 2011;4:1-4. Knauth A, Weiss M, Dave M, Frotzler A, Haas T. Comparison of antifog methods in endoscopy. What really helps. Anaesthesist 2012;61:1036-44. Chainansamit S, Piromchai P, Anantpinijwatna I, Kasemsiri P, Thanaviratananich S. Baby shampoo versus commercial anti-fogging solution to prevent fogging during nasal endoscopy: A randomized double-blinded, matched-pair, equivalent trial. J Med Assoc Thai 2015;98 Suppl 7:S128-31.